A. C. Gilbert’s offering consisted of a large plastic turtle, wired to two remote-control units, and a pair of finish line assemblies. As two players pressed the control buttons, a head popped out of one side or the other, and the turtle moved in that direction. Tuggy’s motor was battery-powered. 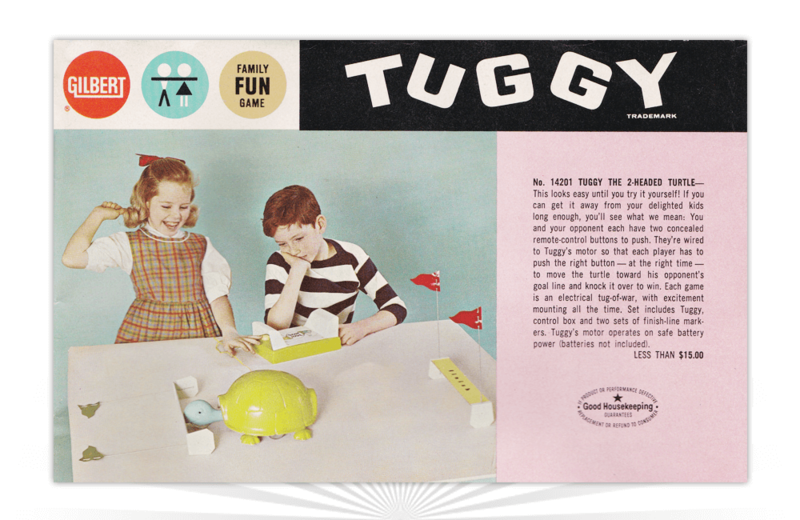 The goal was to successfully move Tuggy towards an opponent’s goal line and knock it over to win. All the excitement... All the Realism.. All the "Bionic" Action! And an opportunity to join The Six Million Dollar Man Action Club to boot!